Over the years I’ve grilled all kinds of things besides sandwiches on the panini maker – from peach salads to duck breasts to ice cream cones and everything in between. Especially with hot summertime weather approaching, I thought I’d try a new “How To Grill ____ on a Panini Maker” series where I can share tips and techniques for cooking indoors without having to heat up the oven. Ummm…Kathy…isn’t it easy enough just to grill burgers outside on the barbecue in the summertime? Well, of course! When you’ve got a crowd coming over for a cookout nothing could be easier than putting a whole bunch of burgers on the outdoor grill. But on a weeknight when it’s just a few folks at the dinner table and you don’t feel like firing up the big grill, you can grill juicy burgers (with grill marks!) in about 7 minutes on your panini maker. You’re cooking all the burgers at once, so to make sure they’re all done at the same time it helps to make them all the same size. It’s especially important to form your patties with the same thickness so the upper grate makes full and equal contact with all the burgers when you close the lid. If some are really thick while others are really thin, the grill will rest on the tallest burgers, leaving the short ones in the cold. Make them all the same height and everyone gets the heat. There’s no shame in it. 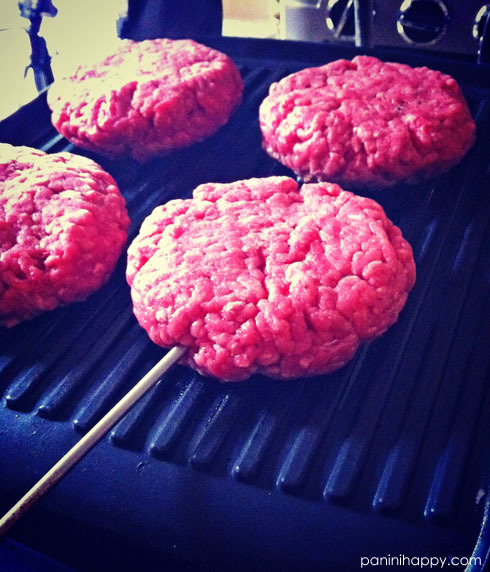 A meat thermometer makes it incredibly easy to tell when your burgers are done – when it reaches the temperature you want (the USDA recommends cooking raw ground beef to an internal temperature of 160°F for food safety; I prefer a pink center so I usually go a bit cooler than that) you pull the burgers off the grill. 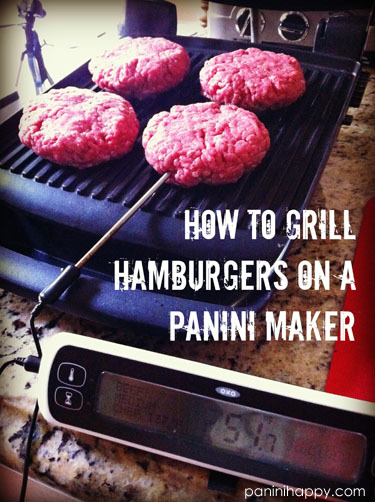 A lot of people can tell when their burgers are done by sight or by pressing the center, but with the panini maker you don’t really want to be opening and closing the lid too often to check. The upper grates make contact with the meat during grilling, which gives those nice grill marks, but if you open the lid too early you risk having the meat stick to the grate. It’s best to just leave the lid closed and rely on your meat thermometer. NOTE: All panini makers heat differently, but I typically will grill on a “medium-high” setting. Once the burgers are done – mine generally take 6 to 8 minutes to get to medium doneness – transfer them to clean plate to rest while you tackle the mess that’s on your grill. Not to worry, the grates usually clean off rather easily if you give it a good scrape down while the machine is still hot. Both the Breville and Cuisinart panini makers come with a little grill scraper – just unplug the grill and scrape off any remaining grease and cooked on bits. Once the grill is completely cooled you can go in with a soapy sponge (or, if you’re using the Cuisinart, you can snap off the grates and pop them in the dishwasher). That’s all it takes! 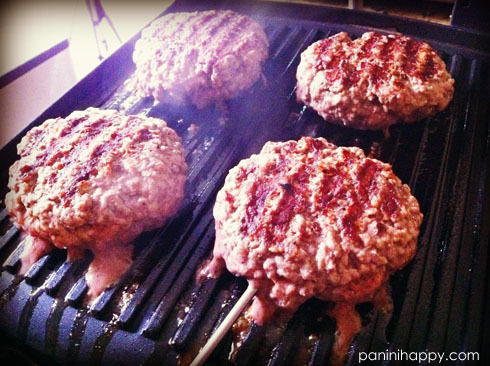 Your burgers are done in less time than it would take to heat up your barbecue grill. If you’d like to toast your hamburger buns as well, just toss them on the grill after your burgers are done (leave the lid open) for a minute or two. What temp do you recommend to cook them at? Thanks for mentioning that, Laurie. Since all panini makers heat differently, but I usually turn mine on to a medium-high setting. Ok, thanks. I’ve done burgers on the panini maker before and they turn out great. Mine only took 3-4 minutes though, and were a little more done than I like. I will try lowering the temp and using the meat thermometer. Thanks for the idea! This is wonderful! I live in a small apartment and don’t have a grill, so I’ll definitely be doing this soon. Thanks! What a great how-to post. 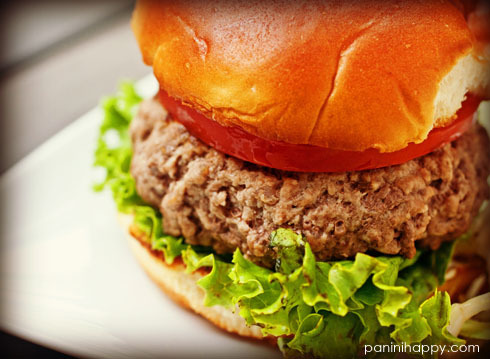 I love a good burger and hate relying on my hubby to fire up the grill to have one! Was just thinking about doing this last night! Wasn’t sure about the timing or temp, so I didn’t. But now I can! I’ve done burgers on my panini press (Cuisinart), as well as chicken breasts, shrimp, and tofu. Oh, yes, and panini, too. 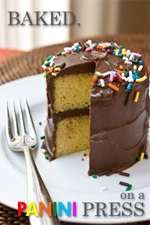 Your recipes give me courage to try lots of things on the press. Wow! Never thought of that one! Thanks so much. This way burger making would be so much easier! LOVE doing burgers on my panini maker! These tips are fantastic and I can’t wait to implement them. So great seeing you this weekend! You know i do this all the time!!! So easy and fabulous! Hi Judy – there will be more advice on grill position in my cookbook later this year, but generally speaking I am to apply the very least amount of pressure to avoid squashing. The ability to regulate this varies a lot by the grill model you’re using. With some, like the Breville grill, you can adjust the height of the upper plate and fix its position. I find the easiest way to clean the grill plates is to take a double square of paper towels and get them wet. 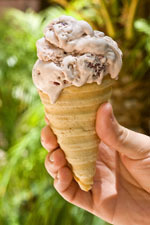 Wring so they are not sopping wet, then open the grill and lay the paper towels down. Close the grill and wait a minute or two. Then open the grill and wipe off. The “steam bath” loosens any stuck on bits and you can just take another couple of paper towels and wipe the grates down. What a great idea, Kate — I need to give that a try. Thanks so much for sharing! How do you go about the cheese though? Heat up broiler for a quick melt without further cooking the burger? I keep reading online that people cook burgers for 6 or 7 minutes. That always gets hockey pucks for me. I have a Hamilton Beech panini press — and after reading these comments, I set it to 375 degrees and cooked 6 oz burgers for 2 minutes. It was almost too long because I then added the cheese and let the burgers stay cooking for another minute on the bottom grill. It was good for me – I like medium burgers but my husband likes his medium rare.